and watching the same spot of reflection as you move, is really the only way to tell for sure how accurate the most accurate jobs really are. 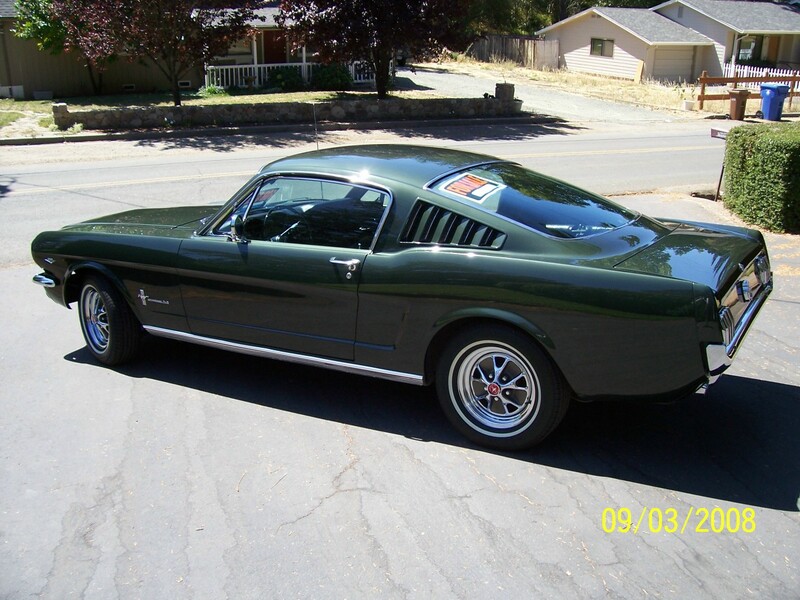 To further illustrate this point, let me direct your attention toward some more shots of this 65 Mustang Fastback, that is much more accurate than most. However, look closely at the reflection in these pictures of the area just below the key lock. Notice how the reflection changes as the view angle changes. Realize that this is a very minor detail, and that most people would never notice it, without it being called to their attention. But if you look closely at the reflection of the rock wall in the first picture, you will notice that at this angle, everything looks pretty good, except that the rock wall makes a slight little upward bend as it passes under the area of the lock assembly. This is an indication that the paint is just a little bit lower in this area than would best suit the natural curve. But with the objects that are being reflected, and at this angle, it doesn't really catch the eye very much. I am fairly certain that when I first finished this car, around 14 years ago, that probably didn't appear that way, but was more accurately in line with the natural curve. Just a little settling has occurred since then leaving most of the vehicle nicely aged, and perfect for someone wanting to touch it up to be even more perfect. If you'll continue reading this illustration, and recognize the concepts presented for analyzing these long gradually curving sections of the body panels, I challenge you to find another Mustang that is as accurate as this one is, even after 14 years of settling. The way the railing is reflected in the second picture is really not that obvious either. But if you look closely at the pickets of the railing, you will notice that they are not spaced evenly in the reflection but seem to be spread apart further. This is also an indication of a slightly lower area. Focus your attention on the area where the quarter panel curves downward to meet the back of the door. The pickets there are closer together than in the rest of the reflection indicating the gradual curve back to meet the door, without a low area. Low areas are usually more apt to be unsightly, but the more gradual and evenly changing the curves are, the better. Many years ago, I did a 66 Mustang on which I created straight lines that passed right through the door joints, making the doors, and the quarter panels, and fenders look like they were reflecting from the exact same gradually curving plane. However on this mustang, the panels curved inward slightly to meet the doors, and the doors curved slightly to meet the panels, all still much more accurate than almost all other mustangs, but not as accurate as my most accurate jobs were. Look closely at the railing top rail. It really is a pretty straight line, but just the slightest raised area is recognizable. The location of this raised area indicates that this area is just a little bit lower that it would ideally be. The third picture over is the one with the angle that is most offensive to me, however most people would never notice this either. Look closely at the white post that holds up the porch roof. Notice how right under the lock it seems to sort of split, and become very blurry. Right at this angle it is reflected as a ripple that just throws off the light enough to catch the eye more easily and distract from the desired perfect reflection creating a fuzzy bright spot. I took a number of pictures trying to capture this for purposes of this illustration. I could see it with my naked eyes, but documenting it on this car, with the camera, was a bit harder. Most of the older cars have so many of these spots all along them, when viewed from these tight angles, that it would be hard to point out why it doesn't look as nice as the really nice ones do. By viewing this one that is almost perfectly accurate in many areas, and then pointing out a spot I would improve upon if re doing it, I am hoping to make it easier for you to tell the difference between the average, and the cream of the crop. Check out the fourth picture. At this angle there is a green bush reflected in the place where the pickets were reflected to far apart in the second picture. Bushes are typically irregular, so everything looks mostly normal. Part of the tree branches reflect in the area above that, just below the lock. Trees are most irregular as well, so that doesn't tell us much about the quality of the body. The only slight indication that there might be a ripple lurking there is the straight line of the railing's top rail that makes just a slight curve upward, and then back down toward the edge of the doors. As mentioned previously while referring to the rock wall, and this railing, this slight upward curve of the railing tells me that this spot is just a little bit low. If I were going to prefect this, I would likely start by carefully sanding down the high areas around it with just the right tools. I actually use these visualization techniques all the time when I am working on high end bodies. Body men for years have focused on and taught each other to use their hands and finger to find the imperfections, but this is work at a level that is much finer than one can ever achieve by feeling with their hands alone. Your finger just don't cover a large enough expanse to feel these details. Look also at the front part of the quarter panel. Focus on the area of the curb just under the rock wall. While this area would not attract much attention, and it does fit into the curve of the panel pretty well. If I were working this one over to prefect it a bit better, I would be happier if that area where the curb drops down, didn't drop that far. This is an indication of an area that is higher than I personally would ideally like for it to be, but it is also over an expanse that ones hand just is not long enough to reach, nor is ones arm sensitive enough to detect. I would likely carefully work it down a bit further carefully keeping the entire curve as gradual as possible. It might not be practical to take it much further down, as close as it is to the stiff curves of the indented body area. But I think it could be improved upon. Body men often talk about bringing down the high places, and raising the low areas, as that is essentially what we do. I often like to relate that to this text in God's Holy Word. In a similar way to the way that the Mustang shown in the pictures above reflects the light coming off the white railing, and other objects, God wants us to reflect the light of His Word that He shines into us, to as many others as possible that His name may be glorified. If you have never before considered viewing car bodies from these angles, you now have received information that enlightens your understand, or in other words you have new light, that enables you to see them in ways that you haven't thought of before. Similar to the way that reading this has focused your attention more closely on car bodies than you probably ever expected, so it is that as we spend time in God's Word, He opens our minds to aspects of His character, that He wants us to ask Him to, and allow Him to, improve upon in us. Fortunately for us, He is the one that has to do that work in us. Our most important duty is the recognize that we need to continue to ask Him to, and allow Him to finish this work in us. His Word is the Light. Jesus also is the Light and perfect example. Reviewing His Word carefully helps us look at ourselves from different angles, and to see things that we couldn't see if not studying His Word. By beholding Him in the light of His Word, He transforms us, for it is by beholding that we are changed. His Word is actually the “Tool of Light” that He uses most effectively to shape us into what He want us to be. It is the Holy Spirit, implanting the principles of God's Word into our hearts and minds that transforms us, and develops in us the attributes of God. We don't even know what to pray for without His Spirit, and the thoughts we receive from His Word prompting us, and giving us utterance. And even then, it is still difficult for us to express what we need to. As one who has spent many hours in the past restoring collector cars, and making other old object, such as my old guitar, look better than new, I particularly like this last one. Having a good foundation is very important. Repairing the breach, and being a restorer of paths to dwell in is a course of action that I pray many others will desire be part of as well. Paths that are enlightening our minds through God's Holy Spirit, by God's Holy Word, paths which are leading us and others toward God's glorious kingdom. Likewise, it's very important to have a good foundation when working on car bodies. Actually, the better the foundation material, such as the metal under the paint, the longer the finish on the top lasts, and the better it holds its shape. Unfortunately, when we worked over this Mustang many years ago, we didn't pay close enough attention to the details of the foundation in a couple of spots. While most all of it looks better than most any other Mustang you'll see, and the foundation of most if it is pretty sound. Over the years, three or four spots have begun to change the shape of the paint a fair bit. Take a look at these pictures if you would like to. These areas just don't reflect the light very well anymore. Yes some light is reflected, but the light is bent here and there, and just doesn't present the same picture that the surrounding body areas do. Over the years, one area that particularly distracts from the rest of the overall high quality appearance of the trunk lid, has developed. I suspect, and seem to recall, that the materials were not blended and prepared properly in this location. A crack has developed in the back of the trunk lid. If I were to repair this breach in the surface, I would likely carefully protect the surrounding surfaces, then carefully cut the cracked area back to solid material. Then using the area that is shaped correctly and still intact, I would refill and finish this area again taking care to preserve the contour of areas not requiring repair. Focusing back on some of the high quality aspects, let me direct you attention specifically toward how the body panels fit together. On this '65 Mustang, quite a bit is time was put into greatly improving on the original shape, by making the doors meet the fenders in a much more accurate manner than they did when it was first made. Most of these '65 and '66 Mustang's doors have higher than desirable area near the seams of the doors to the fenders, and the fenders to the doors, especially on the top more gradually curved sections. As the panels near each other, this higher area curves inward to meet the other panels rather quickly, which greatly reduces the quality of the reflections of originally shaped panels. On this vehicle, these areas were carefully compacted, and shaped so that the contour of the mid sections of the panels are more closely matched contributing greatly to the appeal of the reflections down the sides of the body causing many people to make comments about how much they love this car. The quarter panel extension on the right side of the car fits pretty well, however we should have taken more time adjusting and fitting the one on the left side. If I were to align this one more accurately, I would probably put together a set up that would bend the trunk side top down, and push the bottom part of the quarter panel side in a bit, so that it could be raised up to meet the top of the quarter panel better, and still fit within the other parameters. As the work on the rest of the car had taken lots of time, my friend decided that since he wanted to drive it a bit, we wouldn't take the time for some of these details at that time. Many of the original parts didn't fit very well when these cars were first made. There are many other details that I could direct your attention toward that I don't have the time to illustrate and discuss at this time, and some of those details, that effect the reflection, such as orange peel, are very hard to document with a camera, but I also considered them to be more under the paint classification. As is pointed out in the upper part of this article, when the polishing is half decent, it is the accuracy of the long gradual curving body panels that really sets off the appearance of the reflections. This is the part that is most difficult for the majority of people, and the part that takes the longest to perfect. Though this vehicle has a few glitches, the majority of it is much more accurate than most any other you'll ever find. If I were to perfect this one even further, I would leave most of it the way that it is, carefully protect those portion of it, and carefully cut out the bad spots and re work them back into the shape of the parts that are pretty accurate already. It would take hours and hours of work to ever produce the accuracy of the sum of the whole again, but the bad spots could be brought up to perfection in relatively little comparable time. As this one has been settling for years now, any shrinkage is likely complete so any further improvements would most likely remain for a long time. And so it is as time passes and we become more firmly settled into the truth of God's word, though His Spirit my not be completely finished perfecting us, if we have been and continue to ask Him to, and allow Him to improve on the bad spots, that which already reflects His character the way He want it to will remain. Though one area of the body panel may need to be cut out, it can be brought back into, and refilled to the accurate shape much more easily by using that which remains as firmly established on the foundation of God's Word, as a guide to the correct contour.